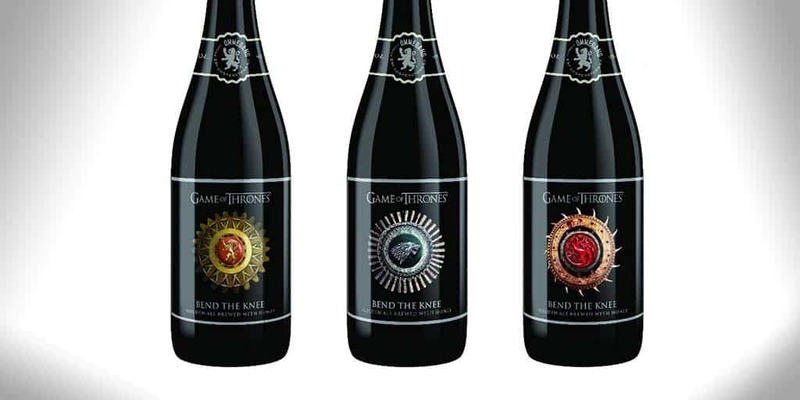 Ommegang Announces New Game of Thrones Bend the Knee Beer | Nerd Much? Ommegang Brewery and HBO have announced yet another team-up this morning, where the former will release a brand new Game of Thrones beer in-time for the upcoming 2017 season. The new Game of Thrones brew will be named Bend the Knee Golden Ale, and it will be available on draft and in a series of three collectible 750mL bottles. Each of the bottles with be adorned with one of three House sigils: Stark, Lannister, or Targaryen. Each of the collectible bottles will also be finished in matte black. Most impressive, though, is that they’ll all come in a 9.0% ABV — it’s the strongest GoT out there, and there are only a handful of Ommegang brews that are any stronger than that. Bend the Knee will be brewed with pils malt and flaked oats, and its hop profile will include Saaz, Bravo, and Styrian Golding hops. Ommegang has added Wildflower honey during the fermentation process to give the beer a touch of sweetness, while it still finishes dry and with slight hoppy bitterness. The bottles will run for $10.99 each. So, how many Ommegang Game of Thrones beers are there? This will mark Ommegang’s eighth Game of Thrones brew, following Iron Throne, Take the Black Stout (my personal favorite, I might add), Fire and Blood, Valar Morghulis, Three-Eyed Raven, Seven Kingdoms, Valar Dohaeris. Now, Bend the Knee Golden Ale will join the ranks, and it will be on shelves Memorial Day 2017 — just in time for the Game of Thrones Season 7 premiere date.